12 cell jiffy propagator with a packet of broccoli autumn spear seed includes expanding jiffy pellets. 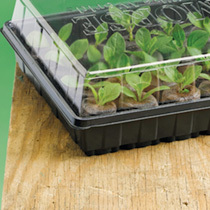 12 cell jiffy propagator with a packet of brussels sprot brigitte seed includes expanding jiffy pellets. 12 cell jiffy propagator with a packet of coreopsis mardi gras seed includes expanding jiffy pellets.